To mark Anzac Day, and the third anniversary of the opening of Gallipoli: The scale of our war, the exhibition’s lead curator Kirstie Ross shares the story nurse of Lottie Le Gallais’ other brother Owen, who was buried alive during the Battle of the Somme in September 1916. Three years ago, Gallipoli: The scale of our war opened to the public after ten months of intensive creative work, captured in these behind-the-scenes videos. 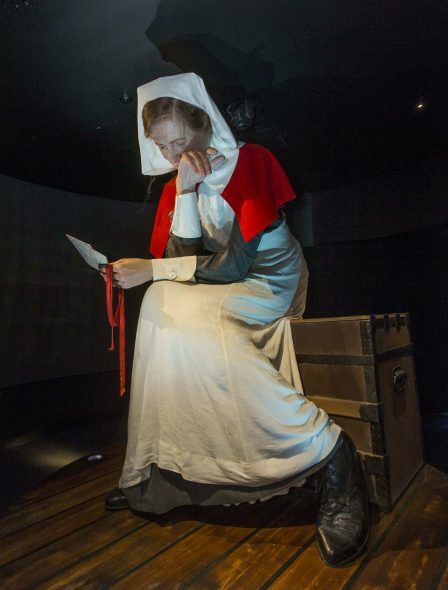 I researched and developed the story of nurse Lottie Le Gallais, which is told towards the end of the exhibition, using the Le Gallais family archive at the Auckland War Memorial Museum. 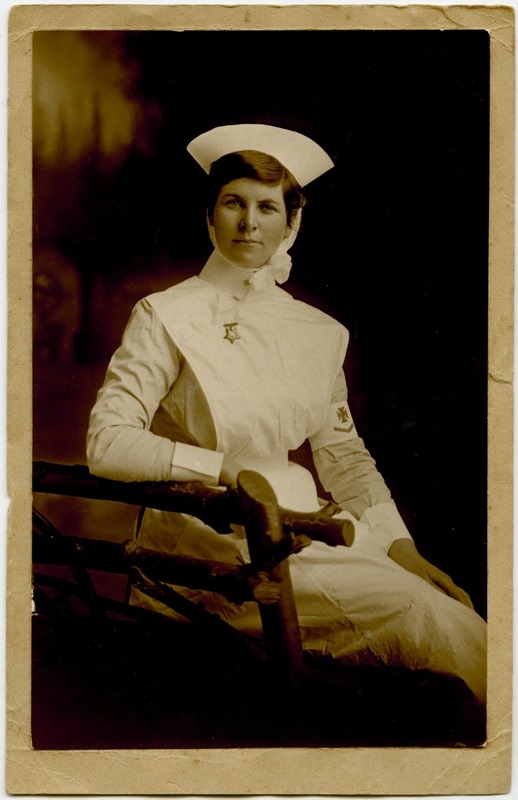 In July 1915, Aucklander Lottie Le Gallais was selected to serve as a nurse on the hospital ship Maheno. She planned to meet up with her middle brother Leddra (known as Leddie), who was on Gallipoli, when the ship reached the Middle East. But this was not to be: the Maheno arrived in Egypt a month after Leddie was killed in action. For the exhibition, we imagined a moment some months afterwards, when Lottie would have finally learned of this, when all of her letters to Leddie were returned to her unopened. Not long after Leddie’s death was confirmed, Lottie left the Mediterranean on board the Maheno. In Lottie’s case, she was heading back to New Zealand for good, while the hospital ship would make many more trips to and from the war zone. But Leddie’s death and Lottie’s discharge from the New Zealand Army Nursing Service did not spell end the Le Gallais family’s involvement in the war. School teacher Owen, the youngest member of the family, arrived in Egypt with the 8th Reinforcements just as the Anzacs were being evacuated from Gallipoli and just in time for Christmas, 1915. He’s in the image above, on the right, with his brother Leddie. In April 1916, Owen moved up to the Western Front as a member of the newly formed New Zealand Division. The Le Gallais family kept in touch from different ends of the earth with letters that they numbered. This meant that Owen knew which order to read them in or when one was missing – the post was erratic, following troops who were constantly on the move. Sometimes soldiers would get no news from home for weeks and weeks; at other times, letters and parcels would all arrived at once. On the 9 July 1916, for example, Owen received 42 letters from friends and relatives, including three from his sister Lottie. Six weeks later, two parcels from Lottie managed to get to Owen, even though the New Zealand Division was marching forward to the front line, about to play their part in the Battle of the Somme. A badly wounded German prisoner sits on the ground awaiting medical treatment. 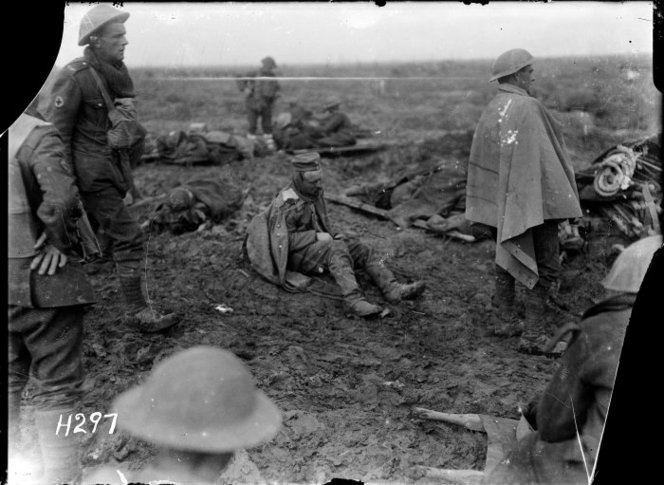 Photograph taken in the Somme area 1917 by Henry Armytage Sanders. H297. Ref: 1/2-012942-G, Alexander Turnbull Library Wellington. New Zealand troops went into battle on 15 September. Ten days later, Owen Le Gallais, like Cecil Malthus who appears at the end of Gallipoli, had a shattering experience in the trenches. Not surprisingly, Owen was still feeling the effects of his temporary burial the next day, writing that he: ‘Suffered from shellshock – lay in hole at sunken road all day’. But this particular trauma did not sent him home. It was a knee injury that Owen sustained in January 1917, when he fell while building sniper parapets, combined with varicose veins. In December 1917, Owen went before a medical board in London which reviewed the 27-year-old’s fitness for a fourth time. The board marked him medically unfit for active service. Owen was relieved. Of the decision he wrote: ‘My lucky day, marked C at 4th Board by Col. Murray. Several of us (mates) drank to our heath with champagne. A jolly time’. 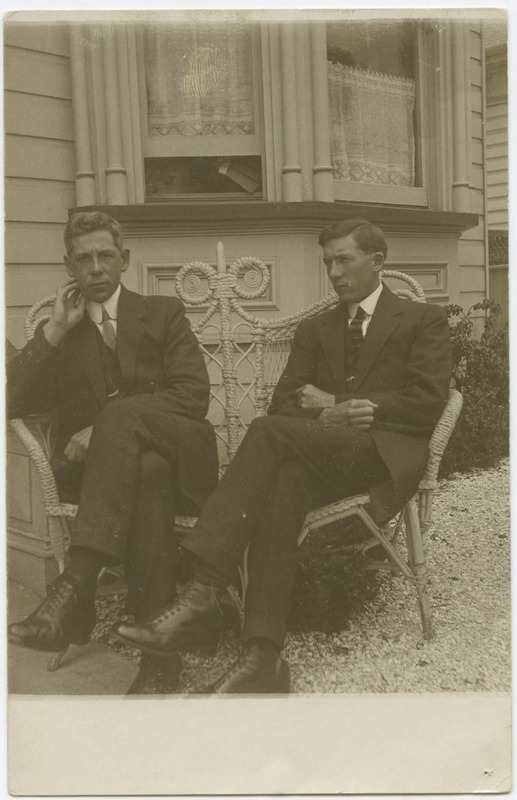 Owen Le Gallais left England on 1 February 1918; six weeks later, his father and Lottie met him in Auckland. The three returned to the family farm at Glorit, in the Kaipara, where the community turned out in force to welcome home the returned soldier. Eighty people gathered at the school house for a dinner, where they remembered Leddie and noted Lottie’s service, and paid their respects to the local boy who had been returned safely to them. Thanks for your comments – always great to have your feedback.